Because you can save money for travel without completely hating your life and giving up those coffees! Here are 5 non-sucky ways to build up your travel fund you may not be thinking about. It’s one of the healthiest things you can do for yourself, but sometimes sleep evades us, especially when flying. It’s essential that I pack items to help me sleep on planes, and I’ve found a few that have done the trick. I accepted a position teaching in bush Alaska and found that information about moving there was scarce. To combat this, I’ve made a modern post on what upcoming teachers should expect to pack. This is what I packed for a trip where I traveled from the tropics of Thailand to the Arctic Circle. 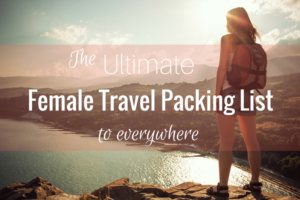 It’s an all climate packing list that fits in a 40L backpack. A trip 5.5 weeks long in less touristy destinations with varied activities… all in a 24L backpack! This ultralight packing list to North and West Africa needs a read. I broke my ankle during a roller derby practice. Despite this, I was determined to have a good time in Hawaii, even while traveling with an injury.